Beginning at the junction of the Stone Cabin-King Valley road and Kofa National Wildlife Refuge; south, east, and north along the refuge boundary to the Stone Cabin-King Valley road; north and west on this road to the junction of the Stone Cabin-King Valley road and Kofa National Wildlife Refuge boundary. See also: http://www.azaccessmap.com/ This website is interactive allowing you to view different map imageries such as topo, aerial, and street. In addition, you can layer the map with game management unit boundaries, wildlife waters, and land ownership status. Overview: Currently there is one permit available in 45C. Most of unit 45C has been exposed to very little disturbance, and the Arizona Game and Fish Department and the Kofa National Wildlife Refuge have been successful in enhancing the habitat through sheep water developments and active lion management. Due to the continues decline of class III and IV rams being observed in the unit, sheep permits continue to stay at 1. All of the sheep habitat in unit 45C is on the Kofa National Wildlife Refuge. Sheep hunters will want to consult with the Kofa National Wildlife Refuge prior to hunting to ensure that hunters are aware of any special regulations that may be in effect. Areas: While sheep are occasional found in the flat areas of U45C moving between mountain ranges, sheep will generally be located in the mountainous portions of the unit. Sheep hunters will want to purchase a complete set of topographic maps, and should use them as a reference for the areas mentioned here. Hunters should keep in mind that very little of the unit’s sheep habitat can be directly accessed by vehicle, rather, the available roads will only get one close. OHV’s may be useful, however, check with the Kofa National Wildlife Refuge about where they can be used and for additional regulations on registration. Off road vehicle travel is prohibited, including travel in washes and travelling cross country to retrieve a big game animal. The Stone Cabin-King Valley road forms the unit’s northern and eastern boundary. From Highway 95, at mile post 55, one can access the southern end of the unit from the Castle Dome Road.. McPherson Pass can be used to travel from the Castle Dome Road to the King Valley Road. The McPherson Pass Road is generally only passable with a four-wheel drive vehicle and you should allow at least 2-3 hours for this trip depending on road conditions. Vehicle travel is limited to designated roads. Overview: For the purpose of deer management, 45C is managed with 45A and 45B as one unit. The deer herd on the Kofa Wildlife Refuge fluctuates up and down regularly. Quality bucks are found in the unit. In 2014, several large bucks were taken in the unit, including a large atypical mule deer buck that scored in the 290 range. Hunters should concentrate in and around desert washes. This is a good strategy, but hunters who are interested in a challenging hunt and larger, older bucks should try the broad, desert flats near to the larger washes, such as those located in King Valley. Hunting the flats is a challenge because vantage points from which to glass are few, but persistent hunters often find the largest bucks here. Whichever strategy one uses, it should involve scouting for areas that show signs of deer usage, and then concentrating the effort on those areas during the season. Even in November, temperatures in Unit 45C can often be fairly warm, so deer will be most active in the early morning and late evening hours. The refuge boundaries are marked with signs but it is extremely important for hunters to know where they are. This might require a little research prior to the season, and most definitely a good set of maps. Areas: All of 45C lies within the Kofa National Wildlife Refuge. The flats surrounding the Castle Dome Mountains contain large desert washes. All washes in this area eventually meander down to the Colorado River. To hunt the washes one should locate deer sign in a specific area, and then spend time glassing into the washes and rolling hills. Successful hunters also glass into the washes in the early morning and evenings from the high ridges between the washes. Four-wheel drive is recommended. Hunters should keep in mind that very little of the Kofa is accessed by vehicle and vehicles are required to stay on designated roads. OHV’s may be useful, but check with the Kofa about where they can be used and additional registration requirements. The Stone Cabin-King Valley road forms the unit’s northern and eastern boundary From Highway 95, at mile post 55, one can access the southern end of the Castle Dome Mountains from the Castle Dome Road. Take McPherson Pass to travel from the Castle Dome road to the King Valley Road. McPherson Pass is passable only with a four wheel drive and you should allow at least 2-3 hours for this trip depending on road conditions. Vehicle travel is limited to designated roads. Vehicle use is not permitted in washes or to retrieve big game animals. Overview: Dove hunting is currently not permitted on the Kofa National Wildlife Refuge. Overview: Unit 45C’s quail populations, like the rest of the state, fluctuate greatly with the levels of precipitation received. The 2017 spring rains provided decent rainfall in the unit. The 2017 season, quail numbers appear average to slightly above. All parts of the unit can provide very good quail hunting opportunities. Areas: All of 45C lies within the Kofa National Wildlife Refuge and is managed by the U.S. Fish and Wildlife Service. The Kofa refuge often supports good populations of quail. The area contains a multitude of large desert washes heading west from the Castle Dome Mountains. During good conditions one will easily find quail in these washes. Four-wheel drive is recommended. Hunters should keep in mind that very little of the Kofa is accessed by vehicle and vehicles are required to stay on designated roads. ATV’s may be useful, but check with the Kofa about where they can be used and ATV’s must be licensed and insured for highway driving. Overview: Currently, mountain lion hunting is not permitted on the Kofa National Wildlife Refuge. Wintertime temperatures can get very cold, especially at night. Summers are extremely hot, and thunderstorms may occur with little warning. Be careful of flash flooding in the washes. Bring lots of water in the summer and proper clothing for protection from the sun. 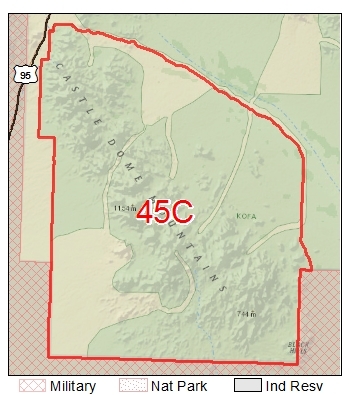 All of 45C is on the Kofa National Wildlife Refuge. All of Unit 45C is comprised of the Kofa National Wildlife Refuge which has no developed campgrounds. All of Unit 45C is comprised of the Kofa National Wildlife Refuge which has no developed campgrounds. Dry and dispersed camping only. Terrain is very rocky with large washes separating rugged mountains. Elevation ranges from just above sea level to 3,000′ on the higher peaks. Vegetation ranges from creosote flats, mesquite, palo verde, saguaros, and other cacti as you head to and up the mountains. The rugged terrain limits access to high clearance four-wheel drive in many areas.